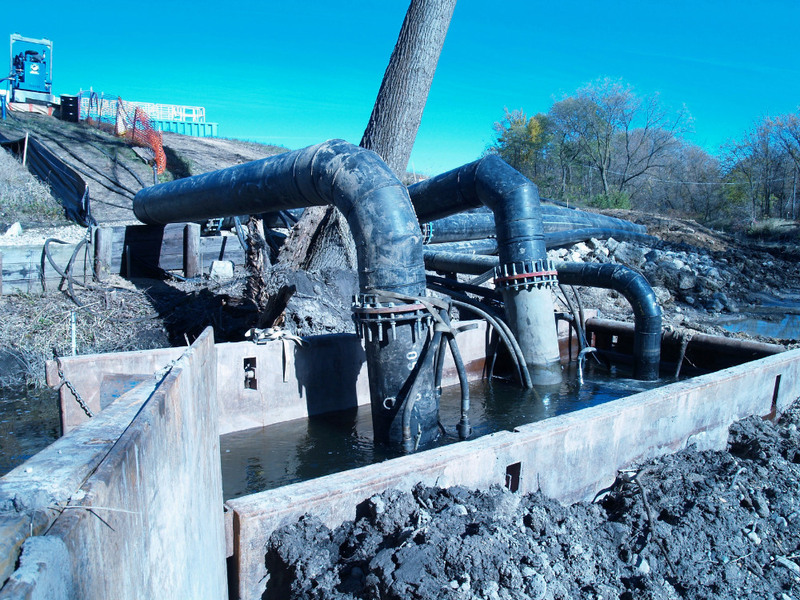 This site at the former industrial facility in Wisconsin required the diversion of an active water course to allow for precision dredging of the stream bed to remove soil containing a variety of contaminants including: vinyl chloride, PCE, lead, mercury and zinc. 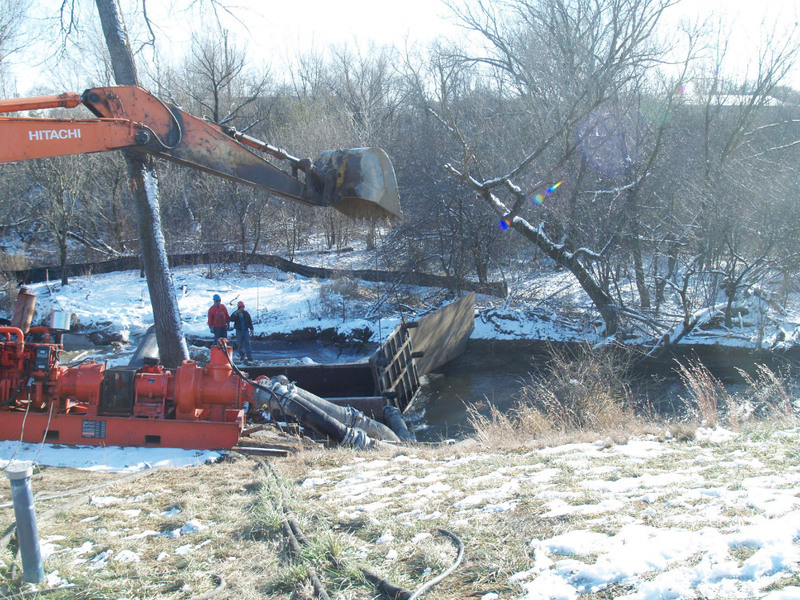 The project was completed under the conditions of a remedial action plan approved by the Wisconsin DNR Hazardous Waste Division and a Chapter 30 permit issued by the Wisconsin DNR Department of Water Resources. The diversion of the stream required the installation of headwater and tail water dams in the stream. The system used to bypass the stream consisted of submersible multi-flow pumps and centrifugal pumps that diverted the ~25,000 GPM flow for approximately 35 days. Once the stream had been relocated, 4,190 cubic yards of sediment were dewatered and removed from 550 feet of streambed. An additional 44 cubic yards of contaminated sediment was removed from 50 feet of an outfall structure leading to the stream and approximately 12,000 SF of wetlands were excavated and dredged. The project also required the removal of sediments, and the cleaning and closure of a partially unlined underground flume. 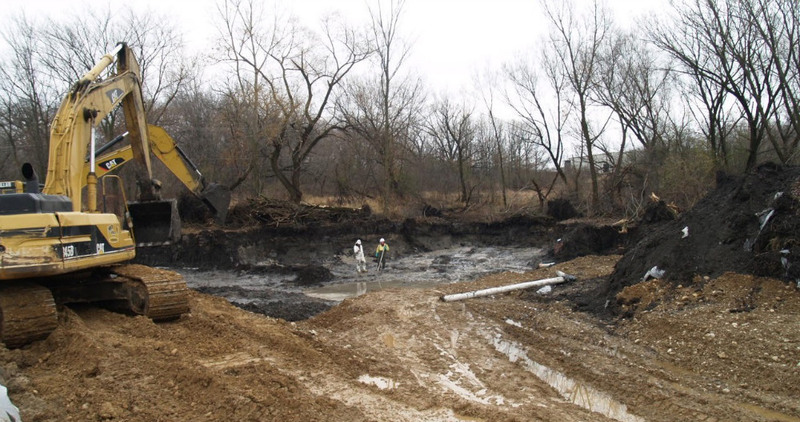 Contaminated sediments were placed in an on-site consolidation area and covered with 2,500 CY of topsoil. The streambed was backfilled and restored, as was the wetland area and the outfall structure. Installation of streambed and bank improvement and protection structures included: log vanes, root wads and riffles. The Wisconsin DNR Hazardous Waste Division and DNR Department of Water Resources conducted inspections throughout the project and found all activities to be consistent with the requirements of the plans and the regulations. Dredging of 4,234 CY from streambed and outfall structure. Excavation and dredging from 12,000 sf of wetlands. Storage and pre-treatment of ~75,000 gallons of water. Bypass pumping at 25,000 GPM. Restoration of wetlands, streambed, and outfall structure. Installation of streambed and bank improvement/protection structures.